"Tours on the hour, every hour by someone who actually works in the brewery, not the Gift Shop counter person. 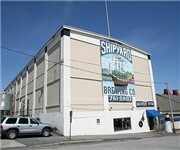 How Would You Rate Shipyard Brewing Co? Federal Jack's / Kennebunkport Brewing Co.